The Alliance for Fair Food is seeking a bookkeeper and funds development co-coordinator to help financially sustain and broaden AFF's work to demand corporate giants adopt the CIW's unique worker-driven approach to social responsibility. Ideal candidates are highly responsible, work well in teams as part of a fast-paced environment, and possess excellent written and verbal skills. Applicants must be fully proficient in Spanish and English; proficiency in Haitian Creole also considered. To request a staff application, please contact Emily at emily@allianceforfairfood.org or call 239-657-8311. Applications are due May 31, 2019. Given our commitment to developing a diverse leadership, we strongly encourage people of color, women, working-class, LGBTQ, gender non-conforming, and differently-abled people to submit applications. A commitment of at least three years is required. The Student/Farmworker Alliance is seeking an experienced organizer to help coordinate the student/youth network within the CIW's national Campaign for Fair Food. Ideal candidates are highly responsible, work well in teams as part of a fast-paced environment, and possess excellent written and verbal skills. Applicants must be fully proficient in Spanish and English; proficiency in Haitian Creole also considered. To request a staff application, please contact Yaissy at yaissy@sfalliance.org or call 239-692-1482. Applications are due May 31, 2019. 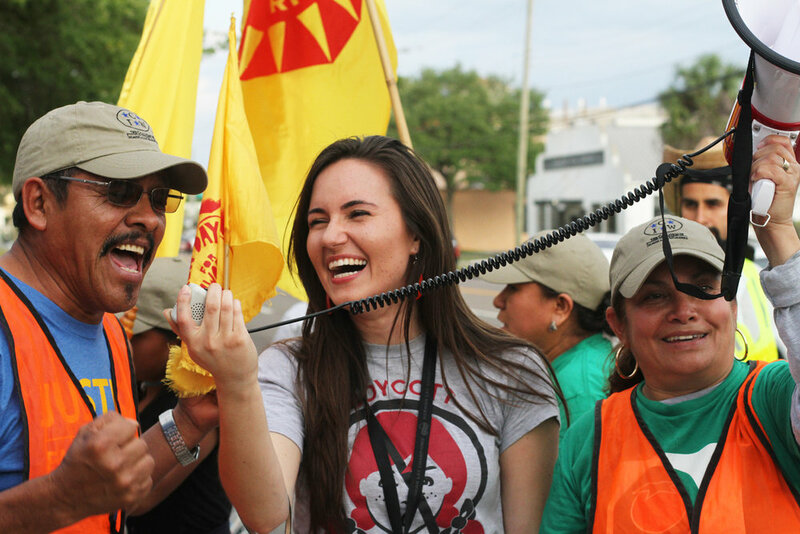 The Alliance for Fair Food accepts applications for summer, fall and spring internships to work in partnership with the Coalition of Immokalee Workers. Applicants should be prepared to commit to a period of 3-5 months. Interns are provided a modest monthly stipend and free housing. Summer internships typically span from June to August. Applications are due April 30. Fall internships typically span from September to December. Applications are due April 30. Intern applications for the summer and fall cycle are due April 30. If you have any questions about the internship program, please email us at organize@allianceforfairfood.org or give us a call at the Alliance for Fair Food office at 239-657-8311.